Just as FDR’s Administration gave Eleanor Roosevelt and Frances Perkins the opportunity to profoundly shape public policy, the New Deal also opened up real and meaningful work for women in the arts. One place this played out was atop San Francisco’s Telegraph Hill, inside a quirky building where four women artists had a crucial role in making the first large-scale New Deal art project a lasting, creative success. At a time when men got nearly all such work, Maxine Albro, Suzanne Scheuer, Edith Hamlin, and Jane Berlandina were among twenty-five artists selected to paint the interior of the newly built Coit Tower, where twenty-seven murals covering 3,691 square feet of wall space took form from 1933-1934, a turbulent time in this city. Painter, muralist, and lithographer Maxine Albro was born in Iowa and came to San Francisco in 1920 to study at the California School of Fine Arts. She later traveled to Mexico, met Diego Rivera, and studied fresco. 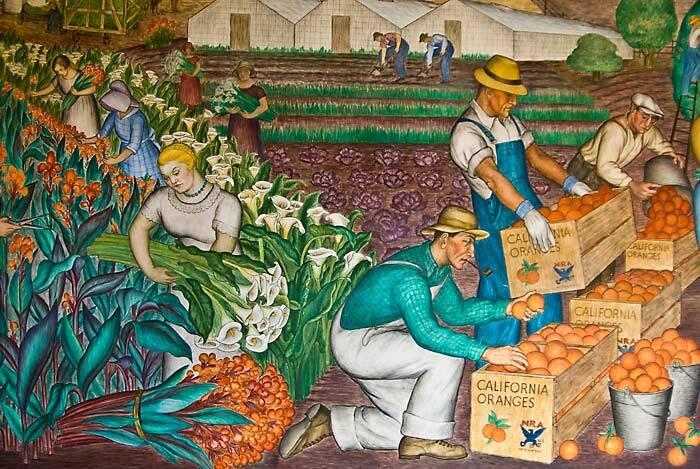 In her Coit Tower mural, “California,” she included the New Deal’s National Recovery Administration (NRA) logo on boxes of oranges being packed by workers in the fields—a nod to the newly created federal agency that set minimum wages and maximum working hours. The model for one of the mural’s field hands was another Coit Tower artist, Parker Hall. Soon after the Coit project was completed, Albro and Hall married, moved to Carmel, and joined the Carmel art colony. Jane Berlandina, born in France, was brought up in luxury. She was entranced by art and earned a degree from the exclusive Beaux Arts National School in Nice where her teacher was post-Impressionist Raoul Dufy whose style is quite different from that of Diego Rivera, the mentor of other Coit Tower artists. 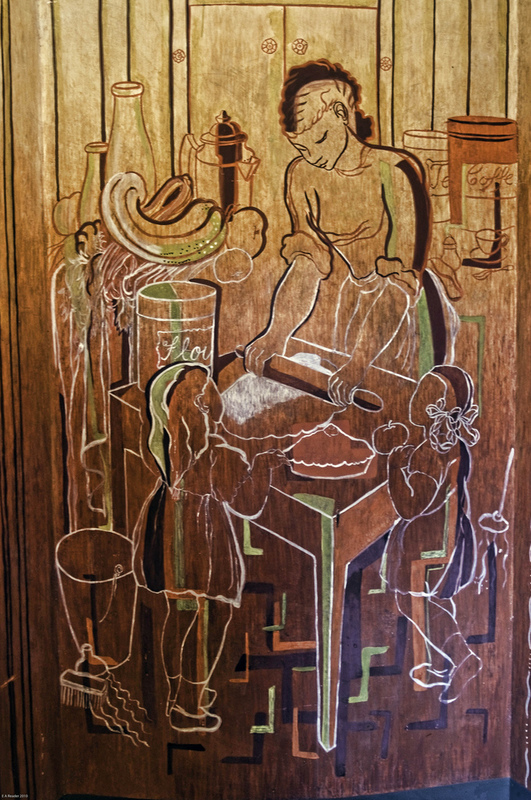 Berlandina’s mural, “Home Life,” is set apart in a small room on the tower’s second floor. 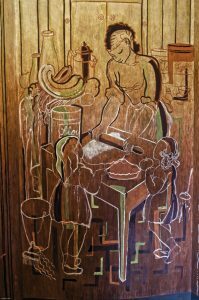 Her use of egg tempera—pigments mixed with egg yolks as a binder—gives her transparent, seemingly unfinished figures a light touch that contrasts with scenes of Depression-era street life and labor strife depicted in the tower’s other murals. Edith Hamlin, born in Oakland, California, was assigned to paint outdoor recreation on the tower’s second floor where elevator doors would be smack dab in the middle of her mural. 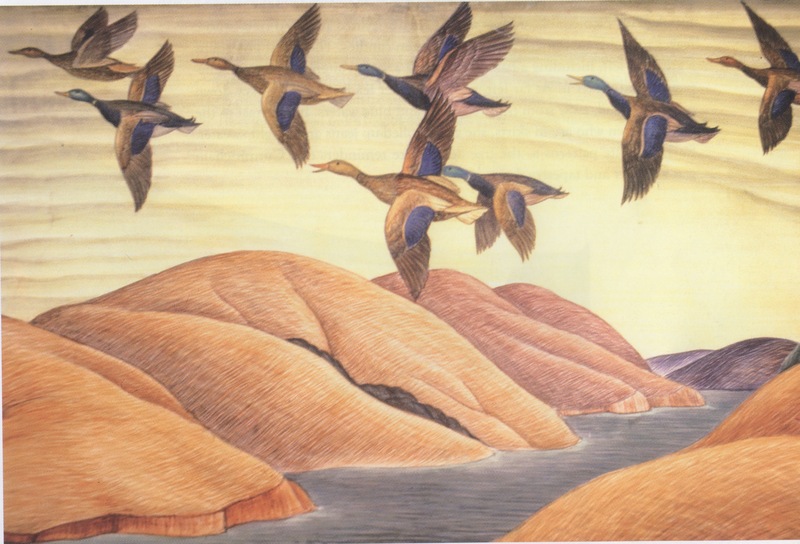 She made the most of it with her fresco “Hunting in California,” which depicts a hunting dog at the ready, a duck hunter with his prize, wild geese flying free, and a deer grazing. Hamlin went on to work for the Federal Art Project, painting two enormous murals at San Francisco’s Mission High School. She later married painter Maynard Dixon at whose San Francisco studio a group of artists had earlier gathered to insist that the government provide work for starving artists—a demand that led to the Coit Tower murals. Suzanne Scheuer moved to San Francisco from San Jose in 1918 and studied at the California School of Fine Arts and the California College of Arts and Crafts. 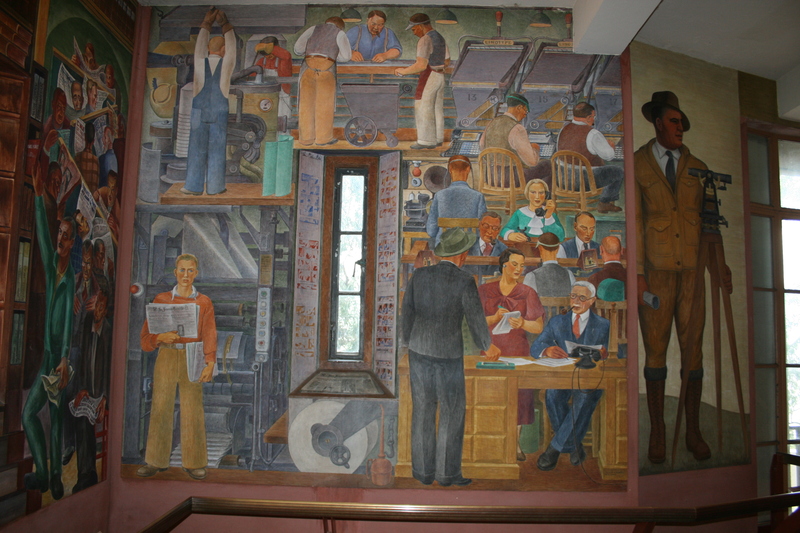 When Scheuer was assigned to paint a Coit Tower mural depicting newspaper production, she was initially reluctant to take on the job. 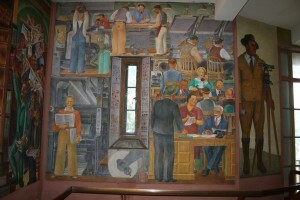 She went to the Chronicle Building, did sketches of the offices and printing plant, and turned them into one of the liveliest of the Coit Tower murals—“Newspaper Gathering.” After the Coit Tower project, Scheuer went on to paint post office murals in Berkeley, California, and Caldwell and Eastland, Texas. She later moved to Santa Cruz, where she designed and built six houses, doing much of the labor herself. The Public Works of Art Project (PWAP), the first New Deal program to employ artists, was short lived, lasting only six months. When it ended in June 1934, it had employed 3,749 artists. The popularity and success of the Coit Tower project inspired the many New Deal art programs that followed. Join a guided art history and exercise walk on Saturday, August 1st, led by historians and interpreters from San Francisco Maritime National Historical Park and Protect Coit Tower. The walk starts at Coit Tower at 10 AM and will end at noon at the Maritime Museum building, in Aquatic Park, just over one mile, all downhill, one-way. The art talk will feature the murals and decorative arts of these two 1930s WPA Federal Art Project gems—contrasting the Coit Tower’s realism and pro-labor message with the Maritime Museum’s fantastical-surreal undersea “Lost Continents of Atlantis and Mu” painted by Hilaire Hiler and the Art Moderne bas relief and mosaics by Sargent Johnson. Along the way, you will enjoy light stretching and a brisk walk through North Beach, one of the most colorful neighborhoods in the city. On May 14, 2015, the one year anniversary of the reopening of a restored Coit Tower, the daughter and granddaughters of Coit Tower mural artist Otis Oldfield gathered together at Coit Tower with Coit Tower preservation advocates to celebrate the improved treatment of the Tower’s historic New Deal murals and to launch a new education project about the 25 artists who painted the historic Coit Tower murals. The new education project will distribute 10,000 Coit Tower Mural Artists educational pamphlets this summer. The pamphlets were created by Jon Golinger of Protect Coit Tower, in collaboration with Susan Goldstein with the SF History Center of the SF Public Library, and printed with generous support from Delia Fleishhacker Ehrlich, great-niece of Herbert Fleishhacker, who was the President of the SF Park Commission when Coit Tower was built. They feature rare photos of the 25 artists who came together in 1934 to paint the Coit Tower murals, the first big art project in the nation paid for by the government through the New Deal. Three years ago, San Francisco voters approved Proposition B, a Coit Tower Preservation ballot measure that required the city to prioritize the millions of dollars generated by Coit Tower visitors for the ongoing restoration and protection of the 81 year old building and its historic collection of 27 frescos and paintings. Before voters approved Prop. B, Coit Tower had lead paint peeling from the ceiling, poor lighting, seeping water leaks corroding the murals, and huge gashes damaging the frescoes. On May 14, 2014, the city reopened Coit Tower following a six-month, $1.7 million repair of the building and restoration of every single mural inside the Tower for the first time in its history. Last month, under the direction of the San Francisco Arts Commission, conservator Anne Rosenthal cleaned the murals and restored minor damage to some of the art from the past year. 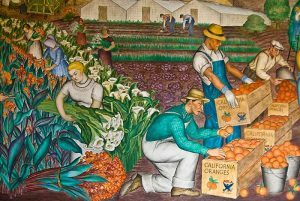 In an effort to expand student and public awareness of the murals at Coit Tower, a Coit Tower Mural Education Fund has been created to expand docent led tours of the murals for students and the general public. Donations will help support student field trips and educational docent tours. Round and round go 2,000 visitors a day at Coit Tower, marveling at the first-floor murals and walking by a double door that leads to the murals no one ever sees. These are the unknown upstairs wall paintings that start with a panorama of Powell Street, climbing the hill as the viewer climbs the steps, and end with a bright painting of domestic life that gets its own little room to wrap around. For most of the 80-year history of the murals, the second floor has been kept secret because the stairway is narrow and the viewing space is extremely tight. The first floor has the rotunda to handle the crowds. The second floor is only as wide as the tower itself, and the seven murals are mostly pressed together at the landing. The unifying theme is recreation, as opposed to the first-floor theme, which is industry and commerce, depicted by people grim with purpose, trying to make their way amid the struggle and strife of the Great Depression. Because all 27 Coit Tower murals were painted at the same time, in 1934, they presumably were meant to be seen as a whole. Now that all the murals have undergone the most intensive restoration in their history, an effort is being made to get people up there, but only in groups of four to eight, and only as part of a docent tour. This can be done either through City Guides, which offers free tours of all the murals on Wednesdays or Saturdays, or through the vendor, Coit Tower Tours, which includes a docent tour of all the murals, for $7 a person. The second-floor tour takes about 15 minutes, which is too short for Golinger. They can only be studied up close, which has a sudden impact when the double door opens to “Powell Street,” by Lucien Labaudt. The mural runs up both sides of the stairway, like both sides of the street, and as you climb the stairs, people climb Powell alongside the cable car. “The stairway mural is superb; it is one of the all-time best within the tower,” says Anne Rosenthal, an arts conservator who led the restoration of the murals, a yearlong $500,000 project overseen by the San Francisco Arts Commission, guardian of the tower murals. At the top of the stairs are two murals that bump into each other. One is “Sports” by Edward Takeo Terada, and the other is “Collegiate Sports” by Parker Hall, which includes a Big Game picture above and around the exit. The marquee mural is “Home Life,’ by Jane Berlandina, a French artist married to Henry Howard, one of the architects for the tower. “Home Life” is the only mural at Coit that is a tempera painting, with egg yolk mixed into the pigment, and it is the only mural at Coit that had never been restored. It took two conservators three weeks to fix the scratches and divots before it was dry-cleaned like the others. The room is flooded with natural light that brings up the yellows and reds. Berlandina also did sets for the San Francisco Opera, and this little room is a set of its own, with curtains drawn over the doorways. Surrounding the viewer are a mom rolling out piecrust with her daughters, people in formal wear dancing to a piano/guitar duo, adults playing cards at a table, and a dad reading the newspaper in an easy chair. Two years after San Francisco voters approved the Coit Tower Preservation ballot measure Proposition B in 2012, Coit Tower has been rehabilitated, the historic murals restored, and new education and damage-prevention measures put in place. May 14, 2014 was a gloriously beautiful day in San Francisco, and nowhere more so than on top of Telegraph Hill standing next to Lillie Hitchcock Coit’s gift to “the city I have always loved.” Along with Donna “Lillie Coit” Huggins, Mal Sharpe’s Big Money in Jazz Band, the fire and police chiefs and assorted city officials, a beaming group of relatives of the Coit Tower artists came together with Coit Tower supporters from across San Francisco to celebrate this long-awaited day. Special thanks to the Coit Tower artists’ relatives who came together in 2012 to urge voters to approve the Coit Tower ballot measure and who again made special trips to be there for the grand reopening: Bruce Chesse (son of Coit Tower painter Ralph Chesse) Pete Arnautoff (grandson of Coit Tower artist Victor Arnautoff), Jayne Oldfield Blatchly, Ellen Fortier, and Rachel Prescott (daughter and granddaughters of Coit Tower artist Otis Oldfield), and Ruth and Adam Gottstein (daughter and grandson of Coit Tower artist Bernard Zakheim). On the eve of the Coit Tower reopening, Carl Nolte of the San Francisco Chronicle wrote a fascinating front page feature story about Otis Oldfield and Jayne Oldfield Blatchly, the “keeper of the flame” of Oldfield’s art. The Chronicle story reads as a wonderful window into life on Telegraph Hill in the 1930s when Oldfield and his family lived on unpaved Montgomery Street and he painted his Coit Tower art. Click on this link to read the story online and see some fabulous photos of Otis and Jayne. Special thanks also to Harvey Smith of the National New Deal Preservation Association and to the San Francisco Arts Commission for their collaboration to create a brand new set of artist informational plaques that now tell visitors who each Coit Tower artist was and provide some context for their art.